So... What's the Hoboken Shore? Glad you asked! 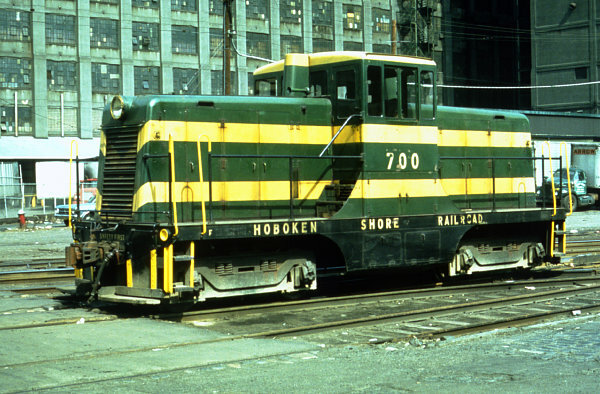 The Hoboken Shore Railroad started off as the Hoboken Manufacturers Railroad, a shortline that served a large industrial clientele running the length of Hoboken's (New Jersey) waterfront. The line had tight curves, street trackage, a float bridge - all elements that endeared the railroad to its fans. Here's a map to get you acquainted with the railroad. 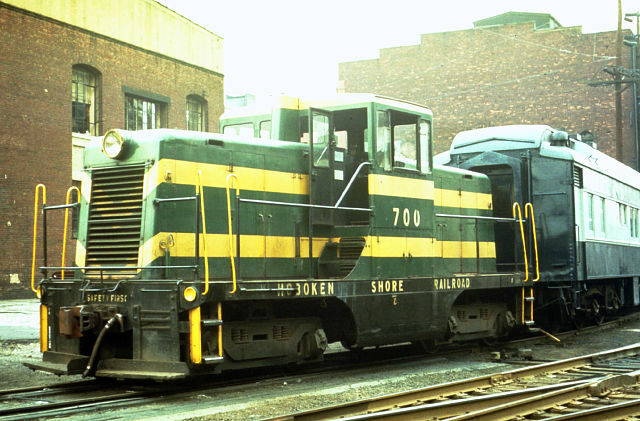 The railroad was renamed the "Hoboken Shore Railroad" in 1954, solely for the reason that "it sounded better!" Traffic started dropping off as industry on the Hoboken waterfront began closing down and moving out. 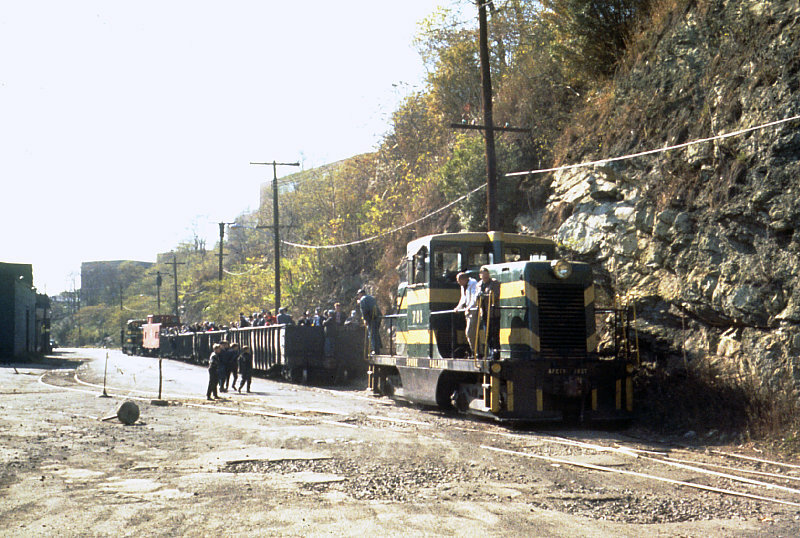 The railroad operated in a limited fashion until at least 1977, and filed for abandonment in 1978. Today, very little of the railroad remains: Its main yard is long gone, enginehouse is now a parking lot, and most of the main is ripped up. 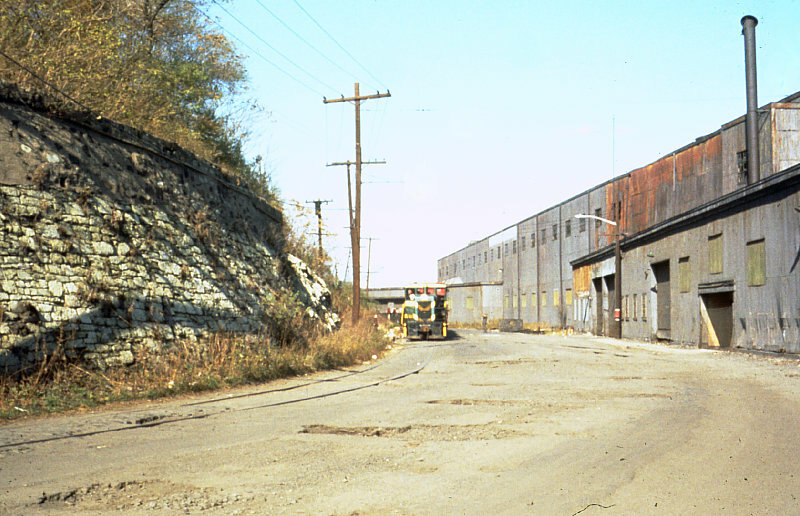 A short section of street trackage remains in place from the vicinity of Maxwell House (today a brewery), running to the new park at 5th Street. Enough already! Let's get to the pictures! OK! 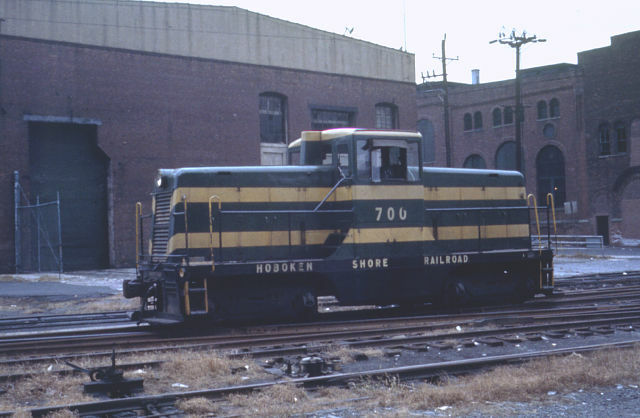 The best place to start would be with an overview of the HBS' predecessor, the Hoboken Manufacturers Railroad. The HMRR started off with steam locomotives, an 0-6-0 and 0-4-0 (both former Army units), and a pair of steeplecab electric switchers (that's right, the railroad had trolley wire!). 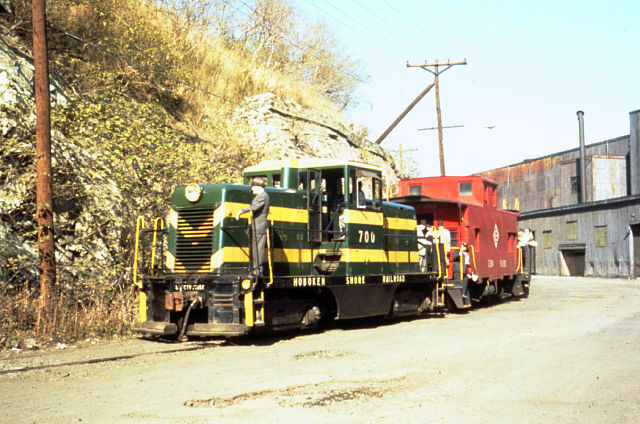 Later on, dieselization's benefits were quickly discovered, and a pair of boxcabs (numbers 500 and 600) were ordered. By this time, the HBS was so busy it was also short-term leasing Pennsylvania Railroad 0-6-0 steam locomotives! 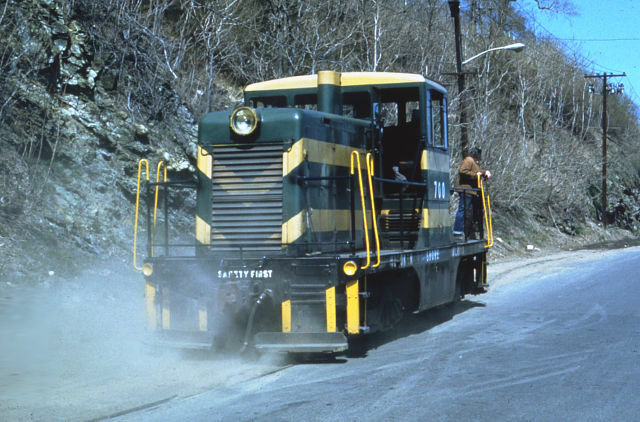 Shortly after the boxcabs arrived, Alco delivered an HH660 numbered 601. 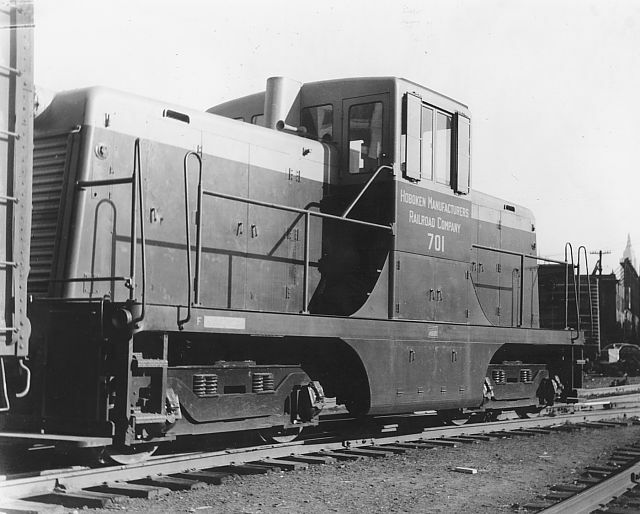 In 1949, the last diesel purchase was made, and the HMRR acquired a pair of GE 44-ton diesels numbered 700 and 701. 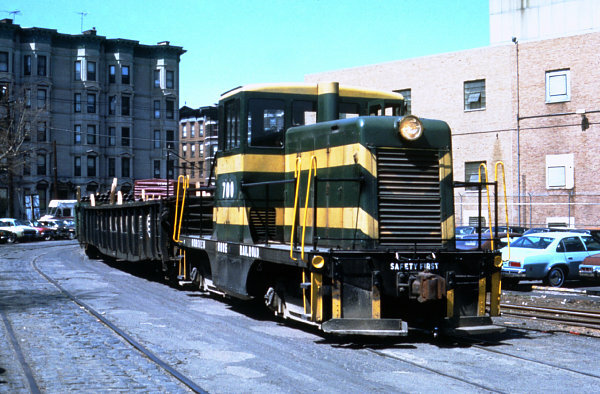 These units wore a sharp maroon and gray paint scheme, breaking the "boring black" scheme of previous diesels, and also honoring local Stevens Institute of Technology's colors. 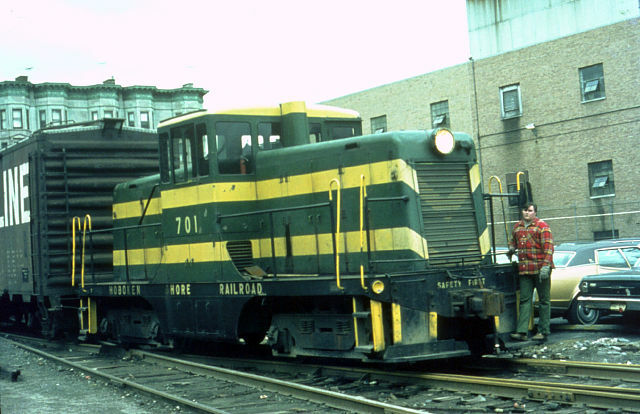 The HMRR 700/701 lasted only until 1953 in their maroon/gray paint before being repainted into a CNJ-inspired green and yellow scheme. The following photos were taken by Donald Van Court in 1949, when he was a student at Stevens Institute of Technology. A very classy looking HMRR HH660 601 switches a mill gon at 14th Street (See Map A). Check out the trackwork underneath the cab! This is the lead into the engine house. 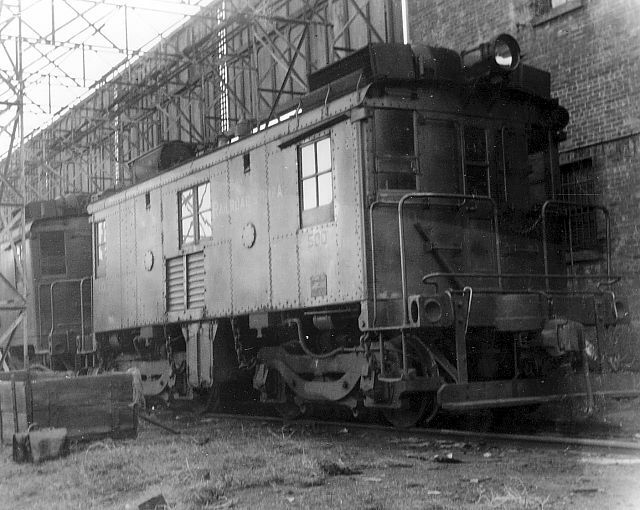 Brand-new GE 44-ton HMRR 701 sits at the 14th Street enginehouse. (See Map A) Note the Empire State Building at extreme right. 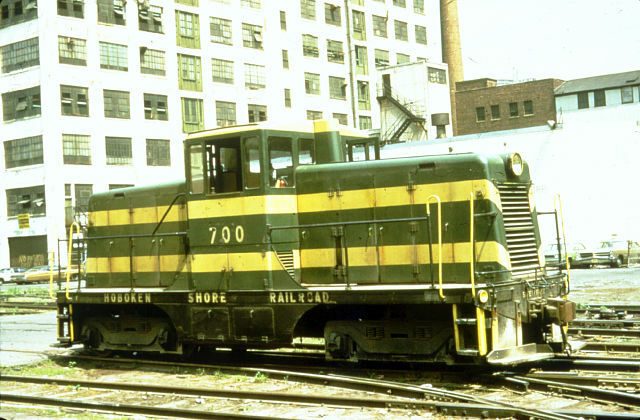 This unit, and companion 44-tonner 700, later survived to become Hoboken Shore 700 and 701. But wait! Where's the newer stuff? Fear not! Here's some extensive coverage of the railroad in its last two decades of operation. We will start our tour from the northern end (interchange) of the line, and work our way south. 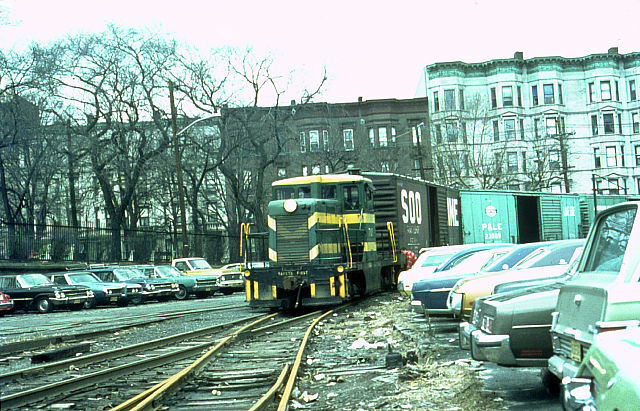 The majority of these shots were taken by Richard Taylor, who grew up in Hoboken during the railroad's waning years. All photos are by Rich, unless otherwise indicated. Each section is referenced by its own map, viewable by clicking on the Map Section title. Let's go! 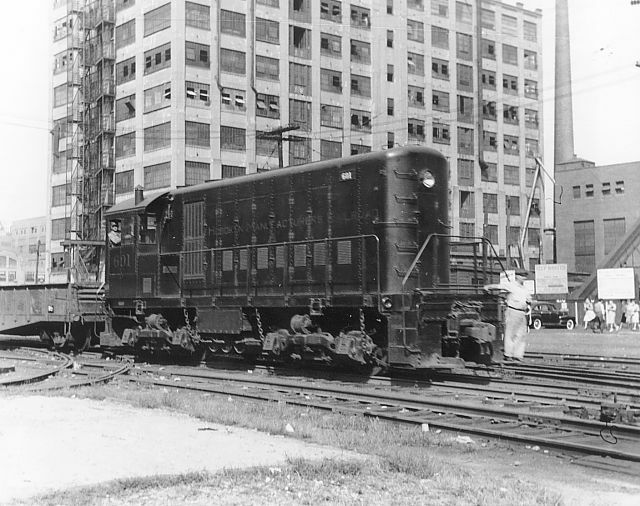 Starting at the northern part of the Railroad, the HBS had a large seven track yard running parallel to Park Avenue. This view is a great shot of the yard, looking toward the south from Park Avenue. Equally odd about this photo is the train: HBS 44-tonner 701 pulls four EL gondolas and an EL caboose - all loaded with people! This train was an excursion run for the National Model Railroad Association, in conjunction with their Annual Convention in New York City. You'll notice several shots of this train throughout this page. 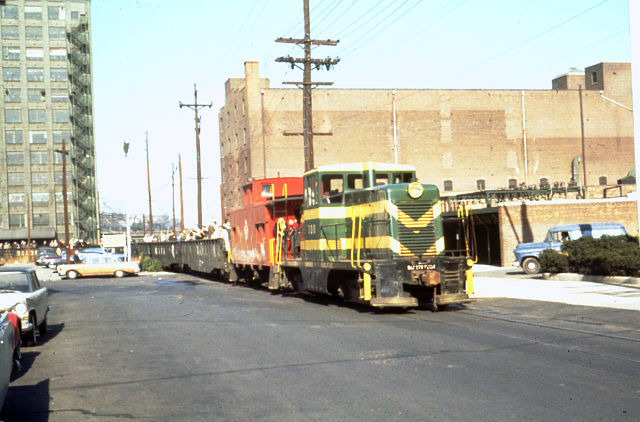 This train is pictured on a sunny October 24, 1964. If you look carefully, you'll see HBS 700 just rounding the curve behind the train (the train ran push-pull - at the end of the line, the other engine took over the train). Also note the long ladder cutting through the center of the yard - all double-slip switches! - this is not noted in the map. The center five tracks are rarely used by this date, and only the outer tracks are used for interchange. Swinging around to the north, this view shows the excursion train approaching the Erie connection. The shadow at the left is the Park Avenue bridge over the Erie's Weehawken Branch and the National Docks Branch (used by the CNJ and LV). 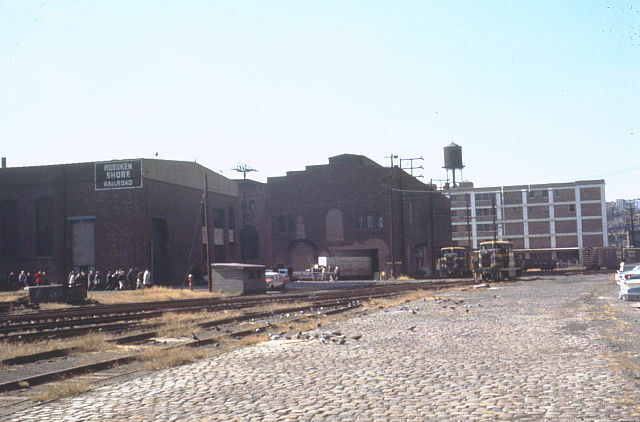 The large brick building at the far left is the Erie Railroad's Weehawken freight house. Today, these two scenes are quite different - no sign of the yard remain, nor do many of the buildings seen in the photos. Going south around the turn in the yard, we enter the HBS' engine facilities and 14th Street industrial trackage. A popular location for photographers, this location was filled with "busy backgrounds," and made for great roster shots, such as this perfectly-lit view of HBS 700. This view is looking north, but this view shows the 700 on an overcast day, sitting in front of the engine house, looking south. The enginehouse door at the left has a notch cut out of its right side, indicating that this building might have been used for something other than railroads at an earlier point in time! 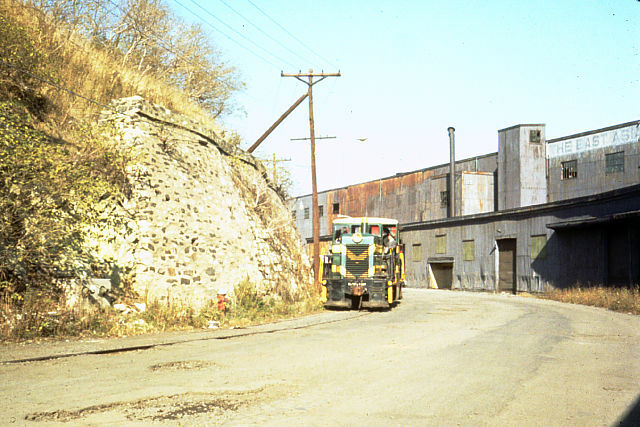 This building is gone today, although the powerhouse at right still stands, unused. The "spirit" of the engine facility is best personified by this superb overview photo. Looking west from near the waterfront, the enginehouse is seen at left (note the painted-on sign!). The two 44-tonners are out on display - the occasion is the aforementioned NMRA excursion (see the group of people in front of the enginehouse?). 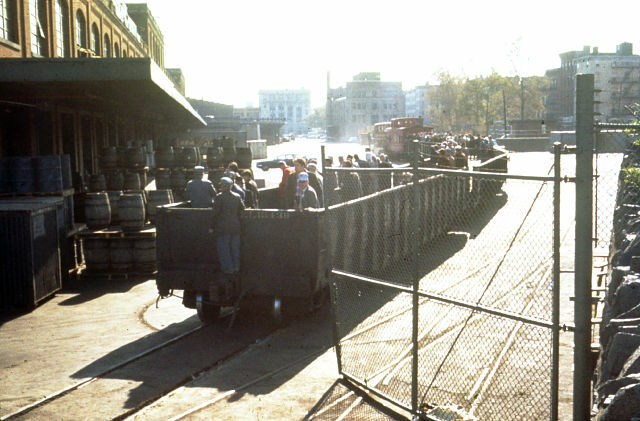 Also note the cobblestone road in foreground for team track unloading. The large seven track yard is out of sight to the right, around the curve where the boxcars in the distance sit. 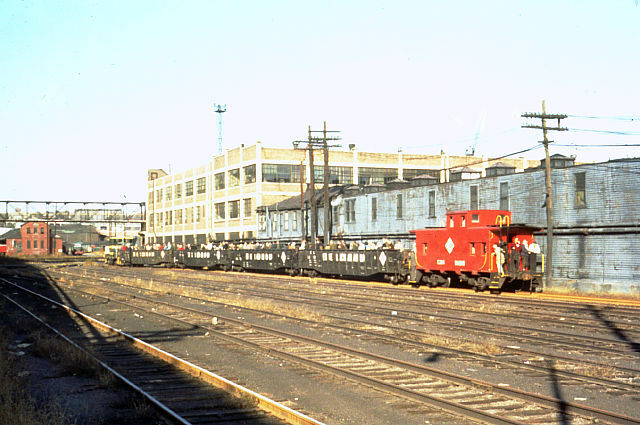 Arguably the most "classic shot" of this bunch, this view of the NMRA group at Hoboken shows their two excursion buses, the enginehouse, and an HBS 44-tonner, as well as the prominent bakery building in the background. 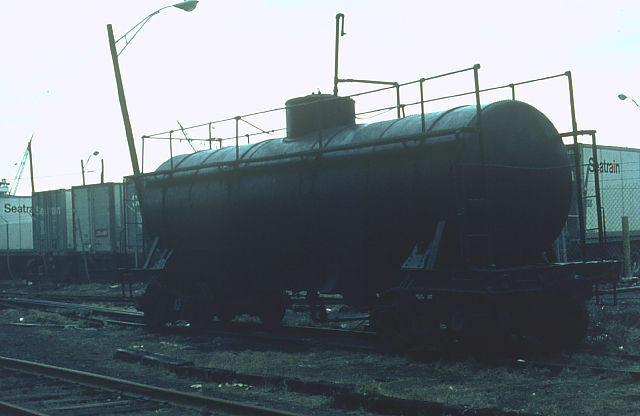 Although the end history of the HBS is vague (and the railroad's records burned in a fire at the enginehouse), it is believed that a new owner stepped in during the early 1970's. This new ownership brought along with it some new ideas and a new spirit. 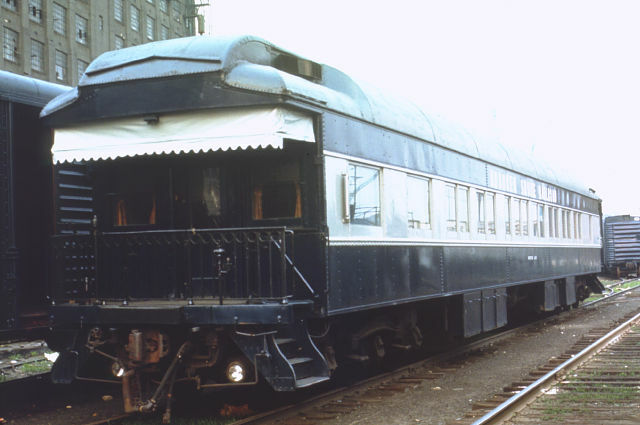 As part of this "new spirit," former Erie Railroad private car #4 was purchased, and repainted in a dark blue scheme with a cream window band. The car was lettered for the HBS, and was given the name "Hidden Lake." 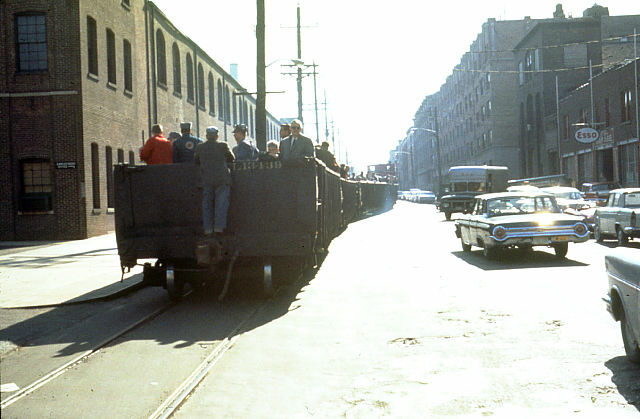 It is doubtful that this car ever traversed the entire length of the line (it would have most likely scraped the rocks around Castle Point), and was most often seen sitting at the 14th Street facility. Here is a shot of the non-observation end of the car, and here's a view of the observation end. 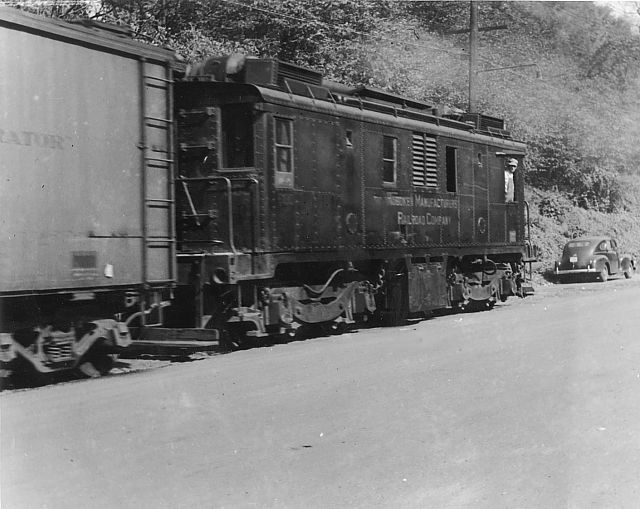 In this latter photo, note the dark green boxcars to the back and left of this car. 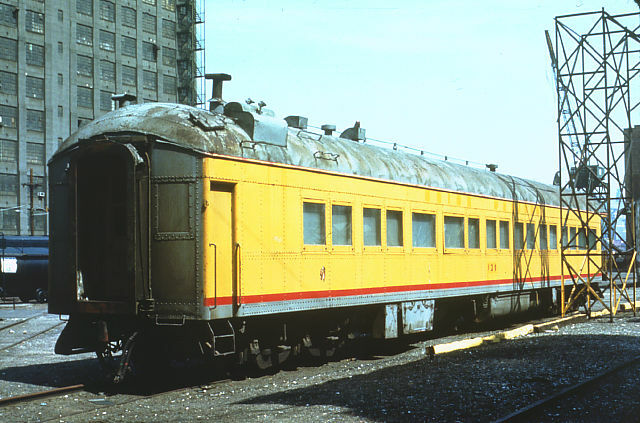 These were a fleet of old, used round-roof boxcars that the railroad stabled in the early 1970's as part of the perdiem car craze. 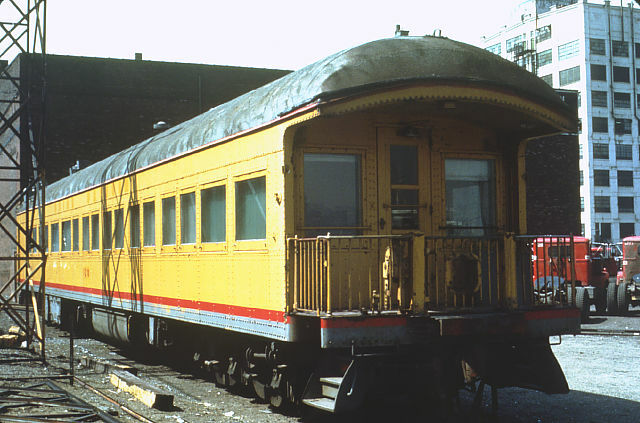 In addition to HBS' own private car, a Union Pacific "Overland" observation car, number 120, sat at 14th Street for quite a time as well. Here are views of the observation end and the non-obs end. HBS 700 shoves a flatcar with a bulldozer load for export south towards the Port Authority piers. The building at left is Maxwell House Coffee. The road continuing straight beyond the flatcar is Hudson Street, and the flatcar is just at the intersection of Hudson and 11th Street. The tracks curve off to the left at this point, following River Street (hidden behind the flat car). 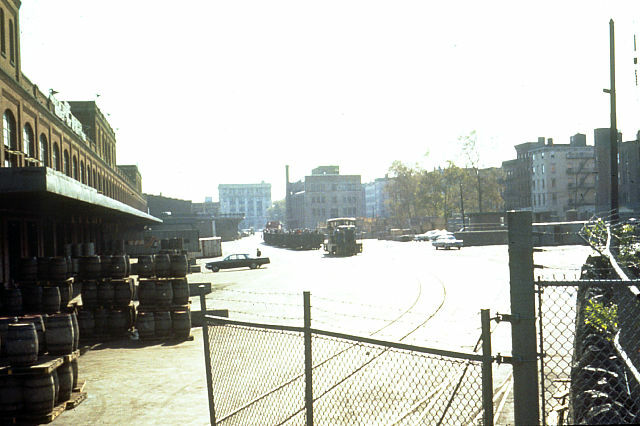 Continuing down Hudson and onto River Street, this view shows HBS 700 and a train of gondolas and boxcars rounding the curve from Hudson Street. 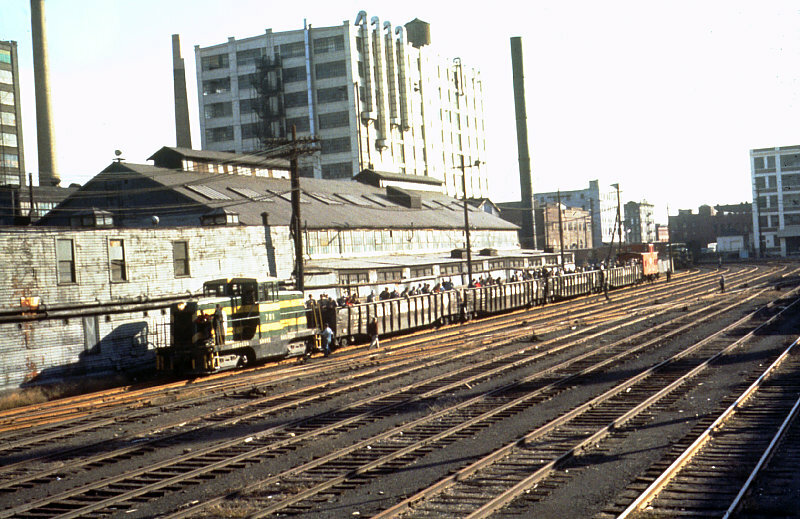 Maxwell House and its employee lot is at the right, and the far right track is the lead into the floatbridge yard. An interesting detail in this photo is the white lettering on 700. Most likely due to the original yellow lettering fading, this unit was retouched with white lettering around 1973. It is unknown if the 701 received this treatment, but based on photographic evidence, the 701 may not have been running that often at this point. Note the catenary support still remaining above the boxcar! 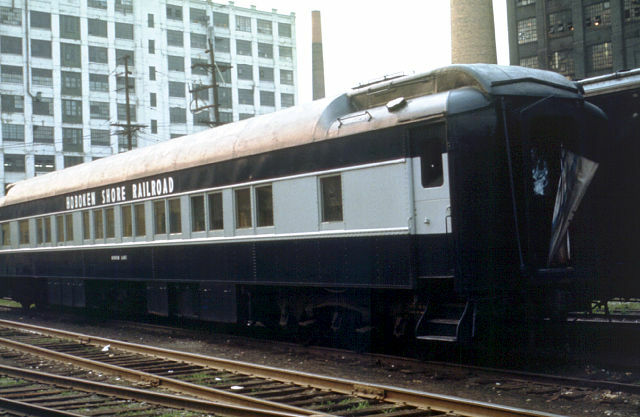 Prior to the carfloat embargo, the HBS used the floatbridge to interchange primarily with the Lackawanna (later EL). 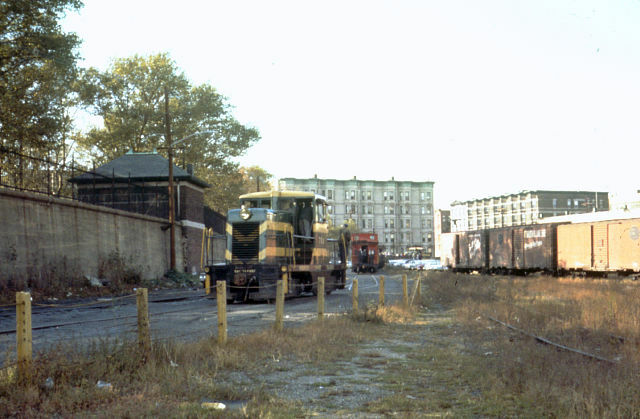 It occasionally interchanged with other railroads in the New York Harbor area, but the DL&W was its main interchange partner here. For the NMRA convention excursion in 1964, the railroad backed a 44-tonner onto the bridge apron and allowed excursionists to photograph and walk out onto the bridge! (wouldn't you just love to be there that day!) 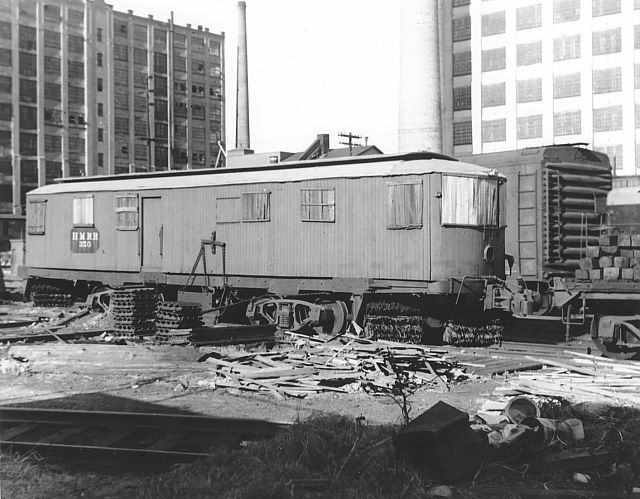 Note the carfloat with a new EL gray boxcar, as well as the unloading platform in the center of the float. After embargo, the only portion that remained was the trestle at left. 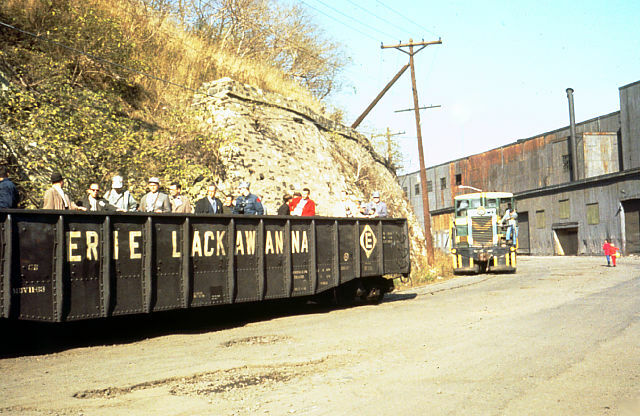 Oddly enough, the floatbridge apron itself was owned by the Lackawanna, which took it after it was taken out. Returning to the "main," we see the 700 following the NMRA excursion on River Street. 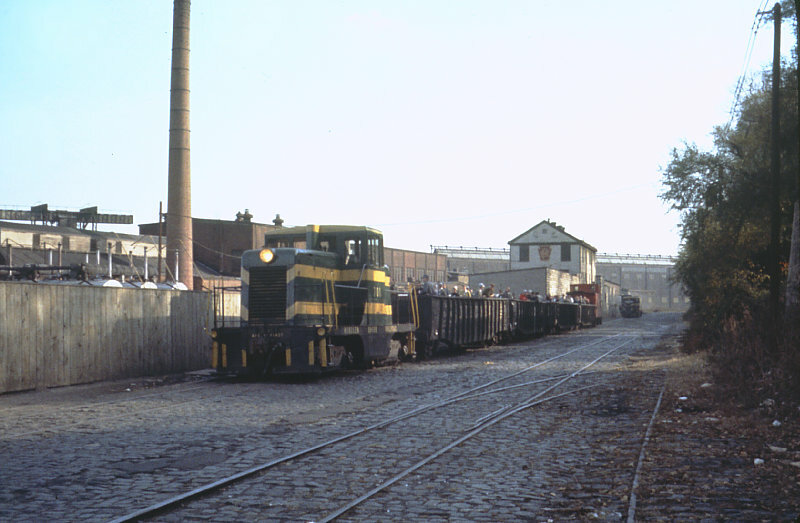 The floatbridge yard, at right, also stored cars for adjacent Maxwell House, and that plant's switch to truck service was the final nail in the railroad's coffin. As we approach the river, we'll move onto Map Section C.
Another classic scene is this view of 701 with the NMRA excursion, returning north on River Street. This scene has changed dramatically today. In the background is the Pennsylvania Railroad marine facility - note the giant Keystone on the building in the background! 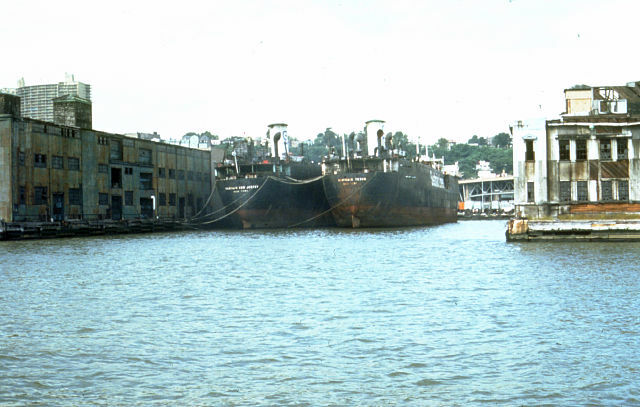 Today, this is a drydock facility for barge repair. Up the hill behind the trees on the right is the Hoxie House, home of the President of Stevens Institute of Technology. Trailing behind the train is the 700. The large building in the distant background is the East Asiatic Company pier at Castle Point. Today, this entire pier is gone, offering a magnificent view of New York City. The cobblestone street here shows its industrial-only use! The track at far right, half-buried in trees and weeds, was used occasionally as a team track. This road is repaved, but oddly enough, the track the train is on is still embedded in the street! Rounding the bend around Castle Point, we see the 700 and NMRA excursion squeaking around this tight turn. A well-dressed gentleman rides the walkway of the GE as it slowly makes its way south. The green and yellow diesel and the red caboose make for a colorful combination! Not to be forgotten, slowly following behind is HBS 701, demonstrating those tight clearances around that turn! Looking the other way, we see the excursion nearing the Port Authority piers. The street here is in atrocious shape, obviously not mean for passenger cars! The building at the left is the Buildings and Maintenance Department of Stevens Tech, on the hill at right. A little further south down River Street, and about ten years later, the 700 (with its white lettering) shoves two gondolas towards the Port Authority piers. Trains to the piers stopped running in the early 1960's when traffic dropped off, but new industry moving into the piers in the early 1970's saw rail service return. The staircase in the distance leads up to Stevens Tech, whose buildings loom above the trees. The condition of the railroad at this late date is reflected in the quality of the track! 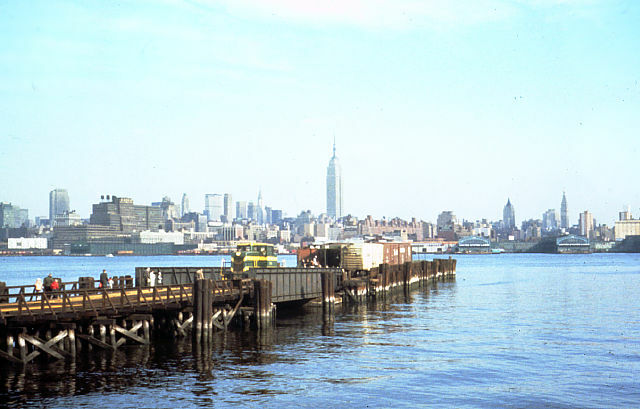 The southernmost section of the Hoboken Shore served the piers of the New York/New Jersey Port Authority. These piers served an extensive shipping trade, and two of the piers had tracks running down the center, within a warehouse-like covering. By the early 1960's, however, rail transportation fell out of favor due to truck competition, and the HBS stopped running to this southernmost point. However, for the NMRA convention in 1964, the railroad ran an excursion all the way to end of trackage within the complex. Seen pulling into the dock facility, the excursion train carefully makes its way down the long-untouched rail - note the flangeways on the track are being cleaned out by the train! Of particular interest are all those barrels and crates on the loading platforms at left! Following our excursion train into the facility is the other HBS 44-tonner. The track on the left now is easily visible due to the freshly-cleaned flangeways! Not really fitting into the scope of the above page, but still having a bearing on the Hoboken Shore, was Seatrain Lines. Seatrain utilized large cranes to load specially-designed ships with railroad cars for transshipment to Cuba and Texas. 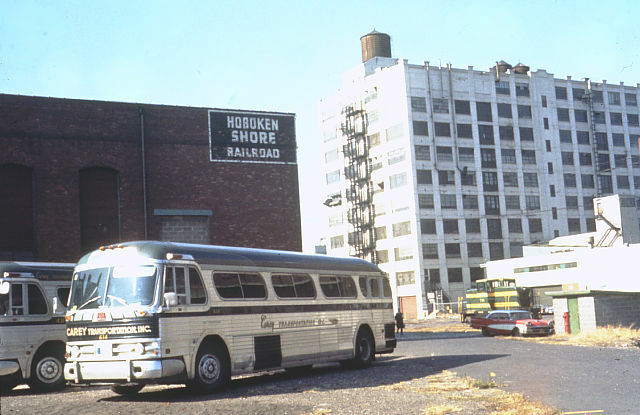 Seatrain started off in 1941 with a pier on the Hoboken Manufacturer's (See Map A), adjacent to the engine facility. 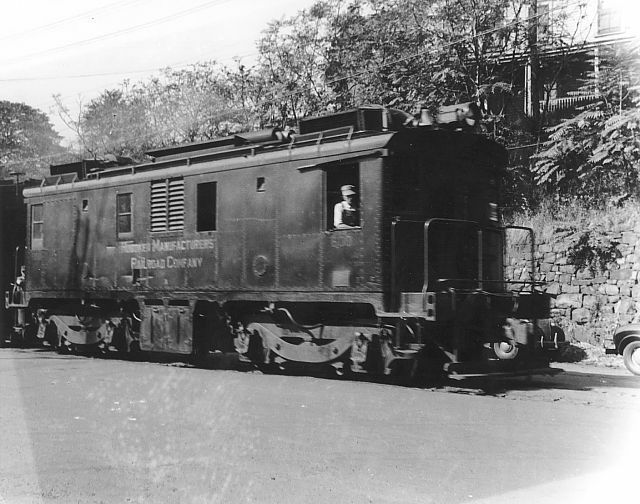 After World War II, Seatrain moved operations to Edgewater, NJ on the Susquehanna. 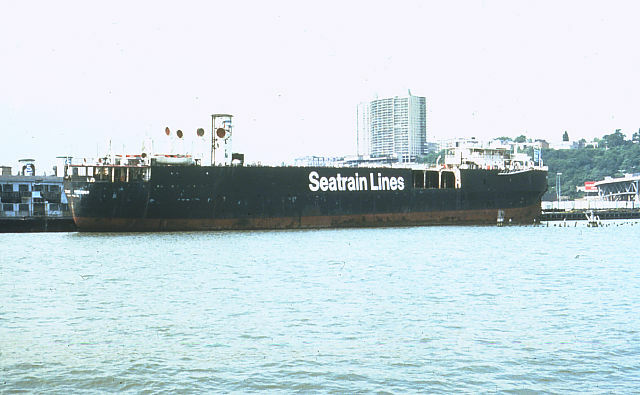 However, Seatrain kept a presence in Hoboken until its bankruptcy in 1979. 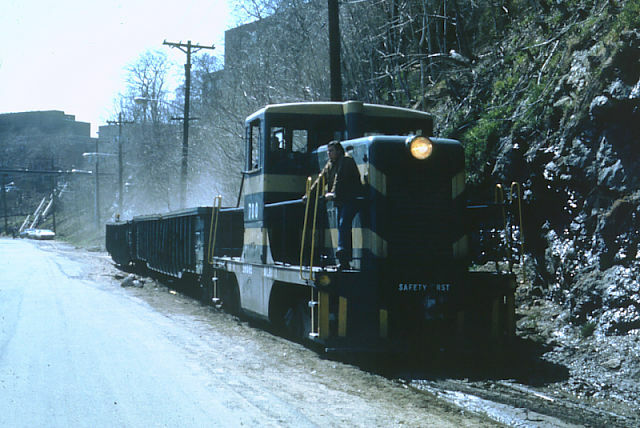 Towards the end of its life, Seatrain shifted from railroad equipment transport to containerized transport, a technique that is well-known today. This relegated its specially-designed ships to retirement. Rich Taylor was lucky enough to catch three of these ships shortly before their scrapping. Appropriately enough, these ships were parked just north of the Hoboken Shore engine facility! 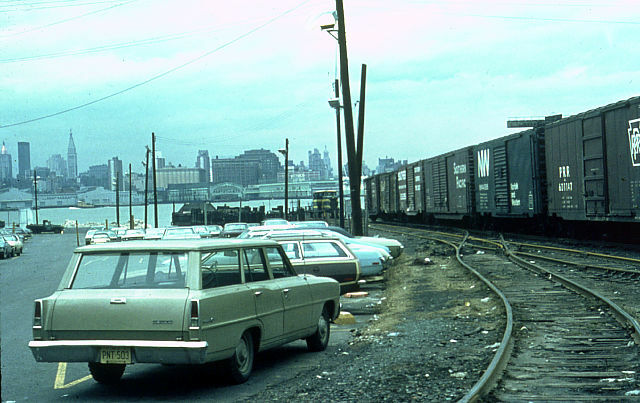 This first view shows the Seatrain "Savannah" parked at Weehawken on September 1, 1972. The bridge truss on the right is part of the ramp to the Lincoln Tunnel. Note the large gap in the side of the ship immediately to the right of the word "Lines" - this is where cranes would load the railroad cars. Looking through the gap, you can see the partitions between tracks on the top level of the ship. These ships held freight cars 5 levels deep! Parked at an adjacent pier were two more ships, the Seatrain "New Jersey" and Seatrain "Texas". 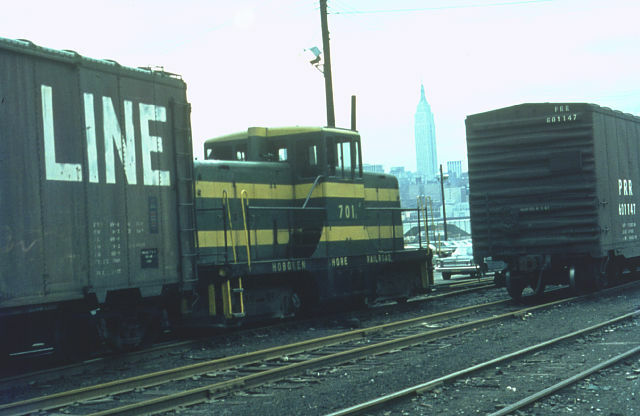 Note the newer Seatrain "S" logo on the stack of the "New Jersey" at left. A big "THANK YOU" goes out to Bill Billings, a veteran of the Hoboken Manufacturer's and Hoboken Shore, for much of the information included above, as well as helping enlighten this fan of what many consider an "obscure road." All photos are copyright by the respective photographers, and may not be reused without permission.